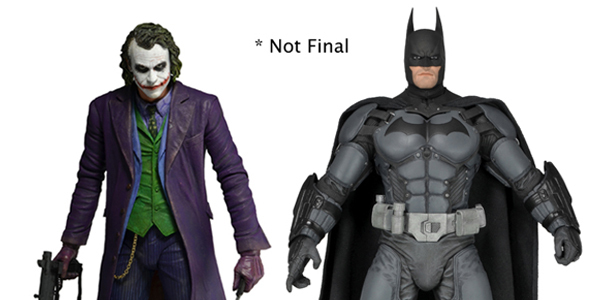 You are here: NECAOnline.com » Licenses » Video Games » Batman Arkham Origins » TOY FAIR 2014: New Arkham Origins Batman and Heath Ledger Joker 1/4 Scale Figures Revealed! Why so serious? It’s the most wonderful time of the year — TOY FAIR! Yes, it’s that special time of year when a young man’s fancy turns to the thought of… toys. Wonderful, magical toys. New York Toy Fair has just kicked off, and we’re practically bursting with new announcements, first looks and awesome surprises. Keep your eyes glued here and to our Twitter and Facebook pages, because we’re going to keep the news coming until they kick us out of the convention center on Tuesday! Today we revealed two new additions to our line of 1/4 scale action figures: Batman from the Arkham Origins video game, and Heath Ledger as the Joker from The Dark Knight! Introducing our first quarter-scale action figure based on a video game! Straight from Batman: Arkham Origins, the latest chapter in the Arkham saga, Batman stands 18″ tall and features over 25 points of articulation, a real fabric cape, and accessories which include Batarang and grapnel gun. This amazing new 18″ tall figure is based on Heath Ledger’s haunting portrayal of the Joker in Christopher Nolan’s Dark Knight Trilogy. The Joker features incredible lifelike detail, interchangeable hands, and accessories which include a knife, pistol, and machine gun.